This auction includes 1x iFlash Quad Micro-SD Adapter which will allow you to convert your iPod Video (5th/5.5 gen) and iPod Classic (6th/6.5/7th Gen) from using a hard drive to using either 1x or 2x or 3x or 4x Micro-SD cards (Micro SD cards not included). 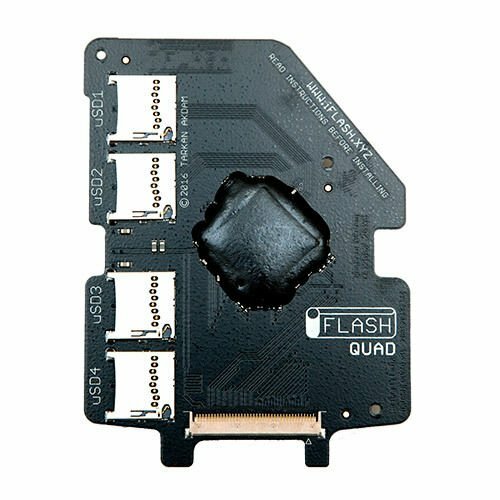 For those seeking solid state storage capabilities for their iPod, the iFlash-Quad allows you to install and use MicroSD cards. Automatic quad mode adapter - use with 1 MicroSD card in standard mode and 2 or 3 or 4 MicroSD cards in mixed JBOD (Just a Bunch Of Disks) mode for even greater storage capacity. Mix and Match any MicroSD cards, you are free to mix any size and any brand to achieve your iPod needs (see known working list for recommended cards). Intelligent power management with much lower power consumption than the original Hard drive, longer run times and quicker user interface. If you have any questions about this product by iFlash, contact us by completing and submitting the form below. If you are looking for a specif part number, please include it with your message.